Beyonce Might Perform At The 2016 VMAs, But Can She Outdo Her Last Performance? With the MTV Video Music Awards fast approaching, everyone's understandably excited to find out who will be performing at this year's ceremony. The latest rumor is that queen of the world Beyoncé might perform at the 2016 MTV VMAs, which would make sense, considering she's nominated for an amazing 11 awards — a personal career best. The 2016 MTV VMAs are guaranteed to be awesome, in part because, for the first time, ever the show is being held at Madison Square Garden. With such an incredible venue locked down, it's natural to assume that the biggest and best of music royalty will be among the acts performing at the awards when they take place on August 28, 2016. But, if Beyoncé does perform, can she outdo her last performance? If you cast your mind back to 2014, you'll likely remember Beyoncé's incredible show at the Video Music Awards, in which she stood in front of a wall of lights that spelled the word "Feminist" in massive letters. It was a career-defining moment to say the least, and a huge statement for the singer to make, particularly considering so many female celebrities continue to distance themselves from the polarizing word. What on earth could Beyoncé do to top her legendary 2014 performance? 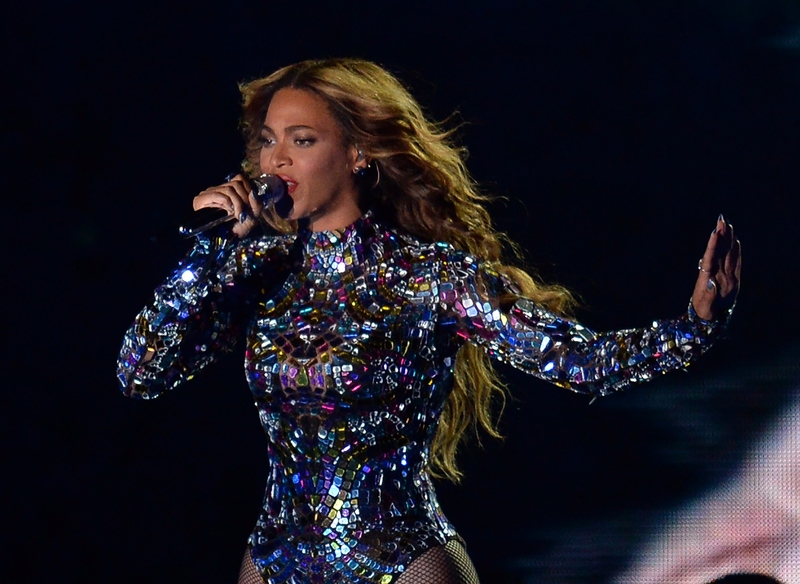 Her concert at the 2014 MTV VMAs was over 16 minutes long, and consisted of a medley of songs from her album BEYONCÉ. The performance was simply stunning, and not just because the artist managed to fit an entire album of songs into her routine. By proudly proclaiming herself a feminist, and refusing to let other people control her narrative or the terms she gets labeled with, Beyoncé showed once again what an amazing role model she is, and a truly individual artist. Even though her 2014 performance was this legendary, I don't think she'll have trouble producing something even more impressive should she perform at the 2016 MTV VMAs. The fact that Lemonade is a visual album, featuring beautiful short films, poetic collaborations, and celebrity guest appearances, means that Beyoncé has a plethora of material to draw upon. Lemonade has such a different vibe to BEYONCÉ, and any performance she does in celebration of her latest album will likely draw upon the album's themes of marital struggles, identity, love, and vulnerability. With so much content to play with, Beyoncé is sure to put on a show more impressive than ever before. And, with 11 nominations, MTV will likely want to celebrate the singer's accomplishments. Contact Music have quoted a source at The Sun newspaper as saying that Beyoncé "is being courted by MTV to perform a medley of her hits" at the 2016 MTV VMAs, which sounds like a totally brilliant idea. Allegedly, MTV has a back up plan, should the singer be unable to attend, and are "planning a musical tribute if they can't secure her." Seeing as she's nominated for 11 awards for her simply jaw-dropping visual album Lemonade, it seems likely that Beyoncé will attend the show no matter what. And I hope she does, because the singer deserves to have her work celebrated, and the stage at Madison Square Garden seems like the perfect place to do it. As Lemonade proves, Beyoncé is someone who lives life on her own terms, and I have no doubt that should she perform at the 2016 MTV VMAs, her performance will be completely incredible and groundbreaking. Bettering previous performances is just what Beyoncé does best.